An advisor to federal and provincial policymakers, Dr. Herb Emery focuses his research on the development of the Canadian economy and the persistence of long-standing regional disparities. Aside from understanding the economic fundamentals of growth in a small open economy, Dr. Emery’s work incorporates political, historical, cultural and other institutional factors that have shaped Canadian development processes. 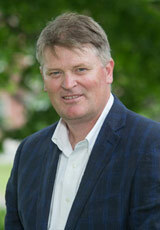 Dr. Emery began as the Vaughan Chair in July, 2016. He holds an MA and PhD in Economics from the University of British Columbia. His academic career began at the University of Calgary where, from 1993 to 2016, he assembled a track record of demonstrated excellence in research, teaching and leadership. At the University of Calgary, he served as Full Professor in Economics and Research Director for The School of Public Policy at the University of Calgary as well as the Svare Professor in Health Economics, a joint position in the Department of Community Health Science in the Faculty of Medicine and the Department of Economics. From 2010 to 2015, he served as Managing Editor of Canadian Public Policy/Analyse de politiques, Canada's foremost journal examining economic and social policy. The Vaughan Chair in Regional Economics was initiated in the late 1980s with an endowment from the A. Murray Vaughan family. The Vaughans supported recruiting someone who could both enhance understanding of key economic issues in New Brunswick and the Maritimes, and help develop policies to increase the overall prosperity of the region. By working with governments, the private sector and non-profit organizations, the Vaughan Chair provides leadership and capacity in policy development for the region, making Atlantic Canadian provinces leaders in collaboration and creative solutions. Emery, Herbert, Norrie, Kenneth and Owram, Douglas. A History of the Canadian Economy, Fourth Edition Toronto: Thomson-Nelson, 2008. Print. Emery, Herbert and Emery, George. A Young Man's Benefit: The Independent Order of Odd Fellows And Sickness Insurance in the United States and Canada, 1860-1929 Montreal: McGill-Queen's University Press, 1999. Print. Emery, Herbert and Ana Ferrer. "The Social Rate of Return to Investing in Character: An Economic Evaluation of Alberta's Immigrant Access Fund Small Loan Program". Journal of International Migration and Integration (to appear), Print. Emery, Herbert, Valerie Fleisch and Lynn McIntyre. "Legislated changes to federal pension income in Canada will adversely affect low income seniors' health". Preventive Medicine, (2013). Print. Emery, Herbert and Jesse Matheson. "Should income transfers be targeted or universal? Insights from public pension influences on elderly mortality in Canada, 1921?1966". Canadian Journal of Economics 44.5 (2012): 247-269. Print. Emery, Herbert, Ana Ferrer and David Green. "Long-Term Consequences of Natural Resource Booms for Human Capital Accumulation". ILRReview 65.3 (2012): 708-734. Print. Emery, Herbert, Aaron C. Bartoo, Jesse Matheson, Ana Ferrer, Sharon Kirkpatrick, , Valerie Tarasuk and Lynn McIntyre. "Household Food Insecurity and Heating Cost Inflation in Canada, 1998-2001". Canadian Public Policy/Analyse de politiques XXXVIII.2 (2012): 181-215. Print. Emery, Herbert and Patrick Coe. "Accreditation Requirements and the Speed of Labour Market Adjustment in Canadian Building Trades". Canadian Public Policy/Analyse de politiques XXXVIII.1 (2012): 91-111. Print. Emery, Herbert and Wayne Simpson. "Canadian Economics in Decline: Implications for Canada?s Economics Journals". Canadian Public Policy/Analyse de politiques XXXVIII.4 (2012): 445-471. Print. Emery, Herbert. "Is a negative correlation between resource abundance and growth sufficient evidence that there is a `resource curse'?". Resources Policy 36.1 (2011): 1-13. Print. Emery, Herbert. ""Un-American" or Unnecessary? America's Rejection of compulsory government health insurance in the Progressive Era". Explorations in Economic History 47.1 (2010): 68-81. Print. Cara L. Brown and Emery, Herbert. "The Impact of Disability on Earnings and Labour Force Participation in Canada: Evidence from the 2001 PALS and from Canadian Case Law". Journal of Legal Economics 16.2 (2010): 19-59. Print. Ferrer, Ana and Emery, Herbert. "Marriage Market Imbalances and Labor Force Participation of Canadian Women". Review of Economics of the Household 7.1 (2009): 43-57. Print. Emery, Herbert and Kneebone, Ronald D.. "Socialists, Populists, Resources and the Divergent Development of Alberta and Saskatchewan". Canadian Public Policy 34.4 (2008): 419-440. Print. Emery, Herbert. "The Premier versus the Aristocrat: Francis Hincks, John G. Vansittart and Voters in the Oxford-General Election of 1851". Ontario History C.2 (2008): 60-86. Print. Emery, Herbert, Inwood, Kris and Thille , Henry. "Hecksher-Ohlin in Canada: New Estimates of Regional Wages and Land Prices". Australian Economic History Review 47.1 (2007): 22-48. Print. Emery, Herbert. "From Defining Characteristic To Vitiation Of Principle: The History Of The IOOF?s Sick Benefit And Its Implications For Studying American Fraternalism". Social Science History 30.4 (2006): 479-500. Print. Emery, Herbert, Di Matteo, Livio and English, Ryan. "Is it Better to Live in a Basement or an Attic? Analyzing the Costs and Benefits of a Union of Northwestern Ontario and Manitoba". Canadian Public Policy 32.2 (2006): 173-196. Print. Emery, Herbert, Crutcher, Rodney A., Harrison, Alexandra and Wright, Howard. "Rates of Return to Investment in Skills Assessment and Residency Training of International Medical Graduates in Alberta". Health Policy 79.2-3 (2006): 165-174. Print. Emery, Herbert and Coe, Patrick J.. "The Dis-Integrating Canadian Labour Market? The Extent of the market Then and Now". Canadian Journal of Economics 37.4 (2004): 879-897. Print. Emery, Herbert and Levitt, Clint. "Cost of Living, Real Wages and Real Incomes in Thirteen Canadian Cities, 1900-1950". Canadian Journal of Economics 35.1 (2002): 115-137. Print. Emery, Herbert and McKenzie, Kenneth James. "Damned If You Do, Damned If You Don't: An Option Value Approach to Evaluating the Government Subsidy of the CPR Mainline". Canadian Journal of Economics XXIX.2 (1996): 255-271. Winner of the Harry Johnson Prize. Print. Emery, Herbert. "Risky Business? Nonactuarial Pricing Practices and the Financial Viability of Fraternal Sickness Insurers". Explorations in Economic History 33.2 (1996): 195-226. Print.